Due to their low cost and attractive thermo-mechanical properties, high-chromium ferritic steels are of particular interest in applications where good resistance to oxidation, high temperatures and high stresses are needed (i.e., filters or catalyst substrates). Additionally, they show promise in supplanting existing metallic and ceramic (non-porous) interconnects in solid-oxide fuel cells. 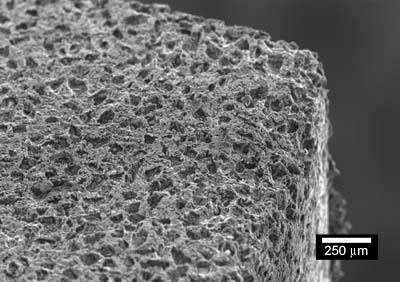 Techniques for processing NiTi-based foams are being adapted to fit the needs of iron-based foams. Subsequently, microarchitecture and compressive mechanical properties will be examined to optimize foaming methods. Justin is examining methods to create high-chromium, ferritic steel foams with an open-cell structure. Both microstructure and mechanical properties will be studied to optimize processing techniques. FIGURE 1: SEM micrograph of Fe-based foam (~50% porosity) produced by vacuum sintering elemental powders of Fe, Cr, and Mo with a salt placeholder.